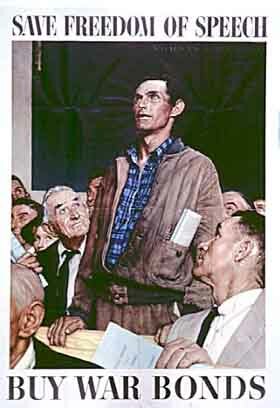 This painting by the American, Norman Rockwell, is one of a set of four called "The Four Freedoms." This one is entitled "Freedom of Speech." Here a citizen is sharing his ideas at a public meeting -- without fear or favour. The idea for the paintings came from a speech in 1941 by the American President, Franklin Delano Roosevelt. "We look forward to a world founded upon four essential freedoms. The first is freedom of expression � everywhere in the world. The second is the freedom of every person to worship God in his own way � everywhere in the world. The third is freedom from want � everywhere in the world. The fourth is freedom from fear � everywhere in the world." One way of participating in the democratic process is by writing letters. Sometimes letters are written directly to politicians; at other times, citizens seek to influence public opinion by having their letters published in a newspaper or magazine. Here is a letter from an eleven year old girl to the important Canadian magazine called Saturday Night. I am eleven years old and in grade six. My class has been studying human rights. I know almost your whole April issue is on how fabulous Nike is ("Hockey Nike in Canada" by Bruce Grierson), but let me tell you about another issue that could fill up a magazine all on its own. Does Saturday Night know where Nike used to set up its factories? Indonesia. Nike has recently moved to Vietnam because the workers in Indonesia wanted more money. They only got twenty-eight cents an hour, while Nike sells its shoes for $100 to $200. Does Saturday Night know why Nike is moving to Vietnam? Because in Vietnam Nike will pay ten cents an hour to the workers. I don't blame the workers for wanting more. My personal opinion is that Saturday Night's article shouldn't be on how great Nike is but on how cheap it is.